Royal Air Force Sopley during the last war (1939-45 -Ed) was an active Ground Controlled Intercept (GCI) station, under the operational control of Fighter Command in the defence of Great Britain. In 1959 the role of the unit was changed to include the School of Fighter Control plus a Special Tasks Cabin, to look after both the military and civil research and development requirements and also to afford control facilities for fighter interception practice for Royal Air Force Chivenor. With the advent of more and much faster aircraft - both military and civil - combined with the growth and complexity of the airways network over the United Kingdom, it was decided by the Royal Air Force, in the interests of air safety, to explore the possibility of using radar to afford positive control of military aircraft crossing airways. 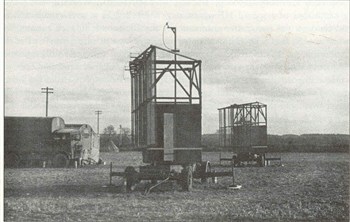 Trials were carried out successfully and, in October 1959, the Air Traffic Control Area Radar system was introduced at Sopley. The School of Fighter Control was later disbanded and the station (including the Special Tasks Cabin) then became part of the United Kingdom Air Traffic Services organisation, which is known today as Military Air Traffic Operations (now  part of Royal Air Force Strike Command). Initially the existing Air Traffic Operations Room at Sopley was equipped with only four radar consoles, but over the years its capability has been increased by the addition of more consoles and height finders, in an attempt to meet the ever growing requirement. In October 1960 and additional unit, known as the Joint Air Traffic Control Area Radar School , was established at the station, and this continues to function today.